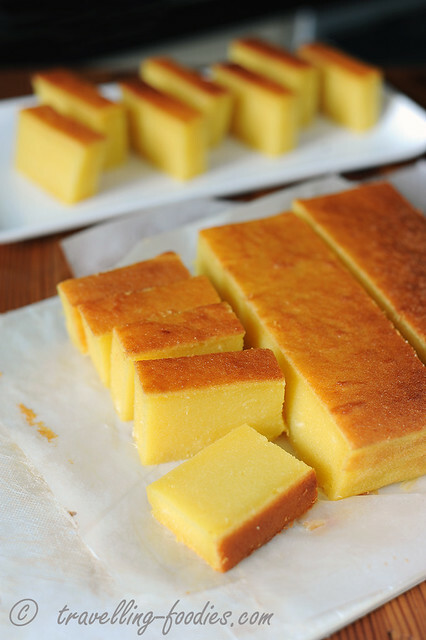 Kueh Bingka Ubi Kayu seems to be a favorite amongst many of my friends and family. Even my neighbour bakes it and we’d been exchanging our kueh bingka ubi kayu amongst other kuehs! 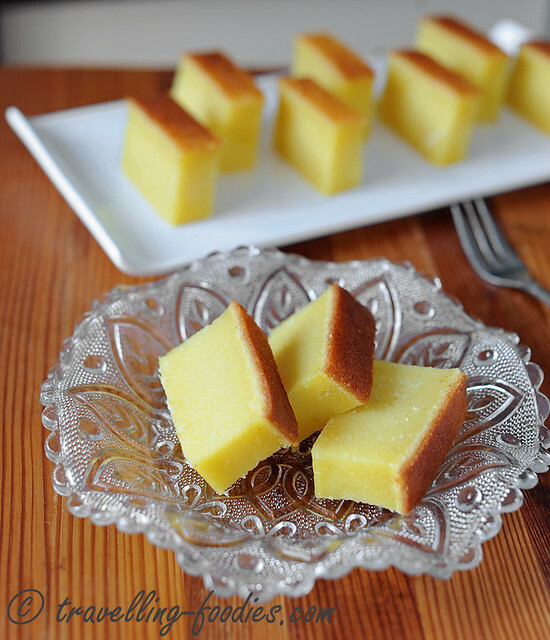 Yes I’d blogged a recipe from Rohani Jelani just last year and it worked really well. After some discussion with fellow baking kakis and friends, I’d modified the recipe and settled with something which I think works really well. 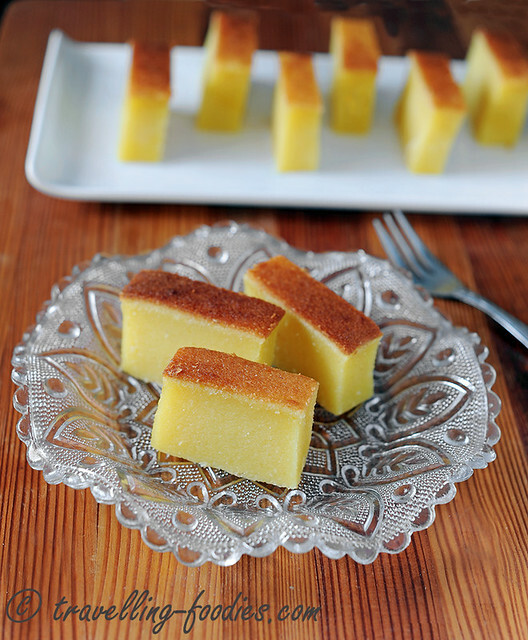 For my most recent kueh bingka ubi kayu, I’d used Thermomix to aid in the process and it most certainly helped to save lots of time and elbow grease. 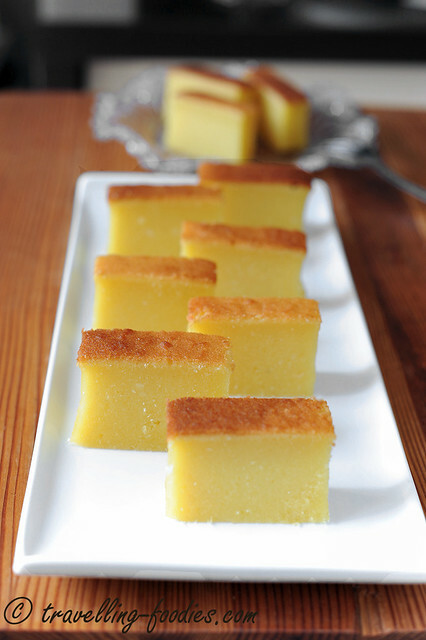 Thus in addition to the conventional recipe, I’d also included on specially for Thermomix users. Hopefully this would inspire me to develop more recipes with this convenient kitchen tool in future. Peel and grate tapioca, taking care not to include the tough and fibrous centre within. Should yield appro. 1 kg of grated tapioca. Using a muslin or cheese cloth, squeeze out as much juices from the grated tapioca as possible into a small clear bowl. Leave the bowl of juices to settle for appro. 30 min. The starch will settle at the bottom with a layer of yellowish liquids on the surface. Carefully decant and discard the yellowish liquids and pour the starch sediments into a large mixing bowl. Into the mixing bowl, add the grated tapioca as well as all other ingredients and mix well. Pour into a 7″ baking tin which has been greased and lined with greaseproof baking paper. Bake in a preheated oven at 170C for 45 min. Turn the cake to ensure even browning and continue to bake for another 15-20 min until the top develops a lovely golden brown hue. Set aside to cool for at least 3-4 hours before cutting. Peel tapioca and cut into 6-8 cm long chunks. Carefully cut each chunk lengthwise into halves to remove tough and fibrous centre within. Place the chunks of tapioca into the TM bowl and add one MC full of water. Cover and process at SPEED 10 with MC for 15s. Remove lid and scrape down the sides and process one more time at SPEED 10 for another 5-15s, depending on how fine one wish the taoica pulp to be. Remove all the tapioca from the TM bowl. Using a muslin or cheese cloth, squeeze out as much juices from the tapioca pulp as possible into a small clear bowl. Carefully decant and discard the yellowish liquids and pour the starch sediments back into the TM bowl. Add the tapioca pulp, as well as all the remaining ingredients into the TM bowl and blend at SPEED 2 in REVERSE MODE without MC for appro. 30-45s until everything is mixed well. Remember to use the REVERSE MODE for the final mixing to prevent the tapioca and grated coconut from being further processed. This entry was posted on May 2, 2014 by Alan (travellingfoodies). It was filed under Food, Simple Eats and was tagged with Baba, Bingka Ubi Kayu, cassava, malay, Nonya, Nyonya, Peranakan, straits chinese, tapioca. If I have demo in Sg normally European do you want to do .